The vision leading up to V Encuentro was to identify and create a path to leadership in parishes, dioceses and on the national Catholic stage for bilingual, bicultural Hispanic leaders. Following the national Encuentro in Grapevine, Texas in September, is this goal still realistic, at least in theDiocese of Tucson? According to several leaders at a follow-up session at St. Anthony’s in Casa Grande Oct. 27, the answer is yes and no. comments during follow-up session at St. Anthony’s in Casa Grande Oct. 27. 2018. 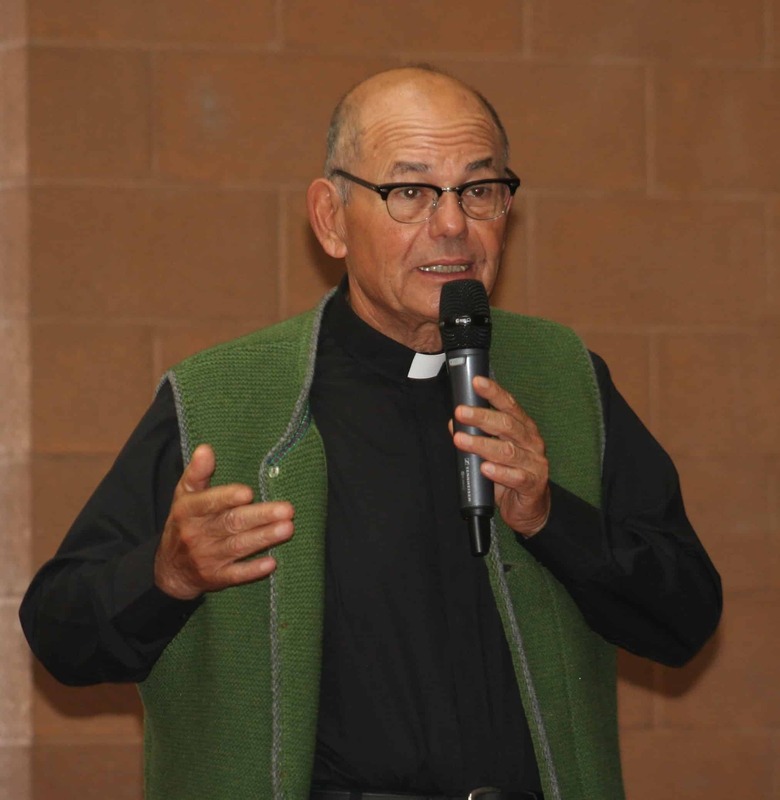 Gonzalez is director of Hispanic Ministry in the Archdiocese of Santa Fe, N.M., and Episcopal Regional Chairwoman for Encuentro for the Southwest US (Region 13), comprised of Catholic dioceses in Wyoming, Colorado, Utah, New Mexico and Arizona. She said the energy of the V Encuentro process will help to continue to prepare Hispanic Catholics for future leadership roles. “The process is working. It’s leading us as a church to a place where we have never gone,” said Msgr. Raul Trevizo, diocesan Vicar for Hispanic Ministry. Msgr. Trevizo has been involved in the Encuentro movement for many years. Last year, he said he was initially skeptical that the V Encuentro, the fifth in a series of national “encounters,” would yield the desired results. However,as he got more involved in the planning, his view changed. With the event complete and work on the implementation continuing, he said that while diocesan and national positions aren’t immediately opening up for Hispanic candidates at many levels, the path to get there seems clearer than ever before. Many of the diocesan participants are involved in or have completed the Spanish language lay certification program offered in the Diocese of Tucson. It is coordinated by Dominican Sister Gladys Echenique, diocesan Hispanic Ministry coordinator, who has been the Tucson point person for diocesan V Encuentro efforts. The Spanish lay certification program has consisted of two levels: a beginners’ level aimed at individual spiritual growth and one that is more geared to catechetical formation, or imparting to participants how to share catechetical, or catechism instruction to other Catholics. From 2013-17, more than 500 people have earned certificates in Levels I and II. This year, there are 195 people registered in Level I and another 72 in Level II. Sister Echenique began offering Level III this year, which provides training on Culture and Faith, pastoral organization and canon law. There are 68 people registered at this level. There is also the Common Formation Program sponsored by the Diocese that prepares candidates for lay ecclesial ministry and also prepares men for ordination as permanent deacons. The Diocese also sponsors the Catholic Bible Institute of Southern Arizona, a program that provides Scripture study for personal enhancement or certification. V Encuentro has produced three positive effects for Hispanic ministry leaders, Msgr. Trevizo said. In the Diocese of Tucson, it showed that the current formation model has been “very effective”; that by creating a vision of Hispanic leadership, it has “given hope” to leaders who might not have thought they could serve in ministry leadership; and that these efforts have “laid a foundation” for Hispanic ministry leaders to build upon to reach their goals of employment in diocesan and national roles. He said leaders who have completed Level II formation already can serve as catechists in parishes, moving up to first step leadership roles. Msgr. Trevizo then talked about continuing to expand lay leadership formation. “We are not there yet in terms of preparing the laity and other leaders for the church” to hire them on a diocesan or national level. If dioceses in the region don’t know or feel comfortable about inviting Hispanic leaders among them to diocesan posts, they aren’t alone, Gonzalez said. At the national level, with the US Conference of Catholic Bishops, there is anxiety and hesitation about raising Hispanic leaders to significant national positions. Gonzalez and Msgr. Trevizo acknowledge that academic credentialing – master or doctoral degrees from recognized, accredited universities – is a major bar to hiring Hispanics for diocesan and national positions. Many non-Hispanic leaders in those positions have earned those degrees, and potential Hispanic successors have not. Given the age and family situations that many of the participants, years removed from college, find themselves, going back to school for a master’s or a doctorate may not be an option. However, Gonzalez and Msgr. Trevizo also agreed that Hispanic leaders with a history in ministry and direct services have relational skills and practical experiences – a “pastoral equivalency” – that is a great advantage in leading ministry, especially with Hispanics. Pastoral equivalencies aren’t easily quantified on an application, but deserve special consideration, they said. There isn’t any agreement on just how much weight those skills and experiences should be given, however. “The different cultural approach represents a life spirituality,” Msgr. Trevizo said, explaining how cultural experience may reflect strong leadership and spiritual skills that should not be ignored. There has to be a recognized value to that cultural difference, he added. “Our role as a church is not to make everybody the same. Everybody brings something special. How do we tap into that as a church?” “That’s challenging for all of us,” he added. There have been a number of studies by groups like the Association of Theological Schools on the “accreditation of prior experiential learning” (APEL), but there is no agreement on universal standards. 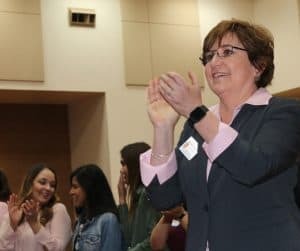 Gonzalez said that in Santa Fe, there are some Hispanic candidates under consideration for ministry to youths and young adults – areas where building relationships are critical – but there are no hiring standards to follow. Gonzalez and Trevizo also agreed that the creation of those standards – and general changes in how Hispanic applicants are accepted for parish, diocesan and national positions – will most likely come from “below,” from parish and diocesan structures rather than guidelines handed down from the national level. 2018 © Reprinted with permission by Catholic Outlook. Article and photos by MICHAEL BROWN Managing Editor. All Rights Reserved.